Has sitting at a desk all day got you bent out of shape? While many people are aware of the tension and stiffness that come from spending countless hours seated and hunched over a computer, there are also some long-term consequences that can arise such as low back pain, neck strain, a weakened front and back core, knee issues and tight hips. Take some time each day to stretch out and strengthen these targeted areas, and feel the workaday stress patterns melt away! Whenever you notice yourself feeling achy or stiff in the neck and shoulders, give these desk-friendly tension-busters a go! Begin with your chin to your chest, then slowly roll your head from side to side, pausing when your ear rests just over your shoulder. If this feels good, begin taking complete circular movements with the head. If you find tight spots or “knots”, hold there and take a few breaths. For an additional stretch, turn your chin down and toward the shoulder; hold for a few breaths, and switch sides. Shrug your shoulders up high to your ears and then quickly release them back down; aim for 10-20 reps. To release further, stand by your desk with feet hip distance apart. Interlace your hands behind your back—if that feels too tight grab a strap (or something similar) to hold. Exhale deeply as you fold forward over softly bent knees, rolling the arms up off of your back. Hold here for 10 breaths. Rise up slowly and release the arms. Hours spent leaning over a desk or computer can lead to a rounding in of the upper back and shoulders. Incorporating a “chest opener” into your daily routine will move the spine into some much needed extension (backbend) after a day of flexion (forward fold), and help to draw the shoulders back. Lay on your belly with your forehead down on the floor or on a folded blanket. Interlace your fingers behind your back and on the inhale, lift your gaze and your upper chest off of the ground as you raise the arms up off of your back and gently tone your buttock muscles. Allow the tops of your feet to rest on the floor. Take a few breaths, and then release the forehead and arms back down; aim for 3-5 reps with a few breaths of rest in between. One of the most unfortunate side effects of sitting for hours each day is the gradual weakening of the gluteal muscles (buttock muscles) which can contribute to many different structural issues in the body, from low back pain to knee instability. To keep your body supported from “behind,” be sure to incorporate poses that activate your gluteals each day. Lay on your back, bend your knees and draw your heels towards your buttocks. Ankles and knees should both be at hip distance. With your arms at your sides, press firmly into the heels to lift your pelvis and low/mid back up off of the mat. Engage your buttocks at the peak of the pose, hold for a breath, and then release the spine back down to the floor. Try to work in 10-20 reps. Follow up with a hugging of the knees into the chest to release. While the gluteal muscles tend to get sleepy and weak with extended periods of sitting, the front of the hips can become overly tight which is another common contributor to low back pain. Try incorporating some long-hold lunges to release the front hip. Begin in standing. Step one foot far behind you and bring that knee down to the floor. Ensure that your front knee is stacked over the ankle. Either raise your arms overhead as you stretch into the extended thigh, or interlace your hands and place them lightly upon the front knee—keep your shoulders back and chest broad. Take at least 10 breaths on each side; these muscles can really take their time releasing! Spending a long time in one position, in seated or standing, can lead to a slumped posture and a disengaged core. Sitting on an exercise ball instead of a chair can help to keep these supportive muscles engaged throughout the day, but so can the way in which you breathe. The diaphragm, your primary breathing muscle, works in partnership with your abdominals—an exhalation and a strong core are deeply connected! 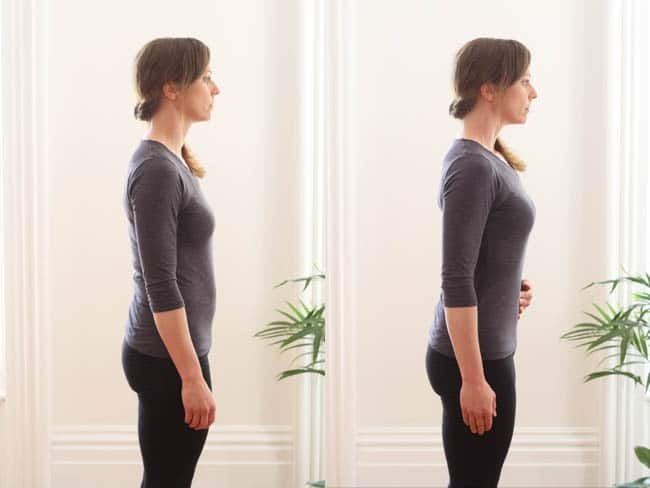 When you notice yourself slipping into a poor posture, try this core-awakening breath cycle: sit up straight and draw your shoulders back. Relax your belly on the inhalation. On the exhalation, press out every last drop of air slowly, through pursed lips or the nose, as you simultaneously draw your belly up and in (think navel to spine). Aim for 5-10 rounds per session and come back to it as needed. I love bridge lifts, great suggestions!